I’ve been working my way through the Whitewater Cooks cookbook, and I’m loving everything I make. 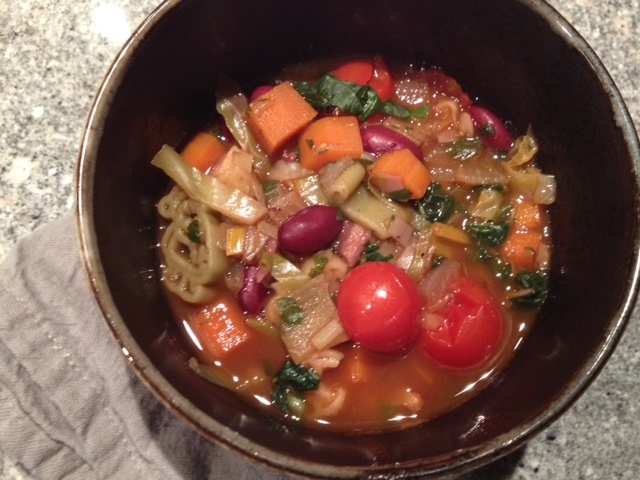 I love a soup that is a meal in a bowl, with lots of veggies and some protein, and of course lots of flavour. This one is perfect, and I enjoyed the leftovers in my lunch all week. You know it’s good when you can eat it for many days in a row! This is a large recipe, enough to feed eight, or two for several days. 1. Fry the bacon in a large pot. When it is cooked but not crisp, remove and drain it on paper towels. Remove the bacon fat from the pan. 2. Add the butter, garlic, carrots, onion and leeks to the pot. Sauté until the onions are translucent. 3. Add the cabbage, potato, stocks, wine beans, canned tomatoes and tomato paste. Bring this to a boil, then reduce the heat and add the oregano, 2 tablespoons of parsley, salt and pepper. Simmer for 15-20 minutes. 4. Add the pasta and cook until it is al dente. 5. Taste and add more salt and pepper if needed. Add the rest of the parsley and the basil. Serve with parmesan, if you wish. I didn’t freeze any of this soup because I don’t like potato in soups when it has thawed; I find that it just falls apart, and I don’t like the texture after freezing.